Capital Punishment means them without the capital get the punishment. Striking 1978 piece by the great artist Peg Averill created for the War Resistors League. 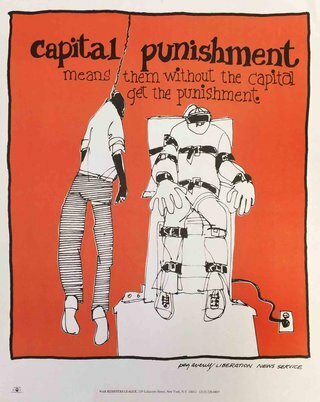 A call to abolish the death penalty on the grounds that systemic and institutional racism and economic bias unfairly condemns more blacks and underprivileged to the death penalty than privileged whites. Printed by the Union and Movement Print Shop in Smithtown, NY.